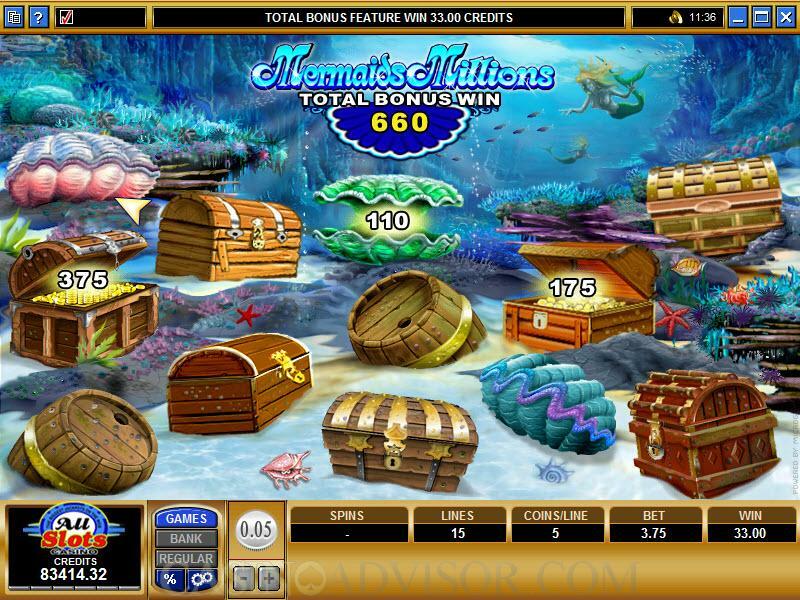 Mermaids Millions is a video slot game developed and produced by Microgaming, the imaginative firm that leads the pack among online casino software companies. .It is a theme that is centered largely on water, mythology and a hunt for treasure. This is a five-reel game, with fifteen paylines, and a maximum bet of 75 coins. There is a wild, a scatter and two bonus games. 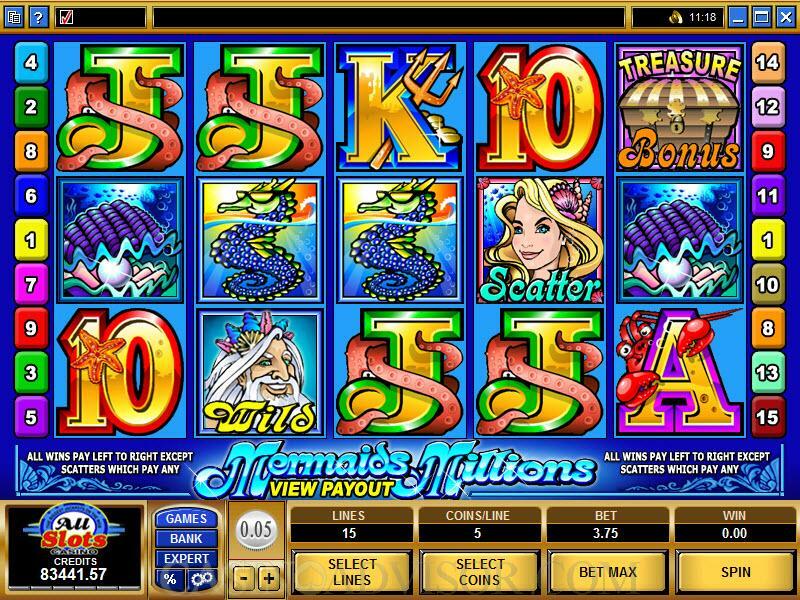 Mermaids Millions commences when you click the "spin" button, which is easy enough to find - at the bottom right-hand corner of the interface. You also have controls to adjust the coin size (between .01 and 1.00) and enable up to 15 paylines. The coin sizes come in increments, and you can also click "Bet Max" and go all the way to the top of the betting scale, so to speak. In Mermaids Millions to maximum bet is 75 coins. 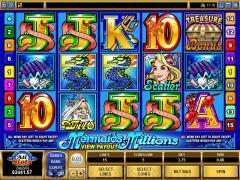 Mermaids Millions has a scatter symbol, which is the Mermaid. Three or more Mermaids will trigger the Free Spins Bonus Game, in which you will get ten free spins (which can become ten more if three or more Mermaids are scattered again). With two or Mermaids, there is also a jackpot payout. The Neptune is a wild symbol, and can be used to substitute for any other symbol (except the scatter or bonus symbols) to complete winning combinations. And speaking of the bonus symbol, that's the Treasure Bonus symbol, which of course, triggers the Treasure Bonus Game, in which you will have the opportunity to choose objects on the screen that have random bonus payouts associated with them. Also, five Neptunes on an enabled payline provide their own treasure, which amounts to a 7500-coin payoff. The Jewel Box and Clam symbols have a maximum 500-coin payout when five of them are in an enabled payline. Interested in reading more detailed information about Mermaids Millions? If so Click Here for more details.